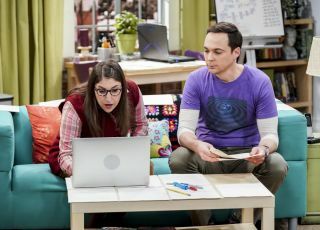 In "The Citation Negation" episode, Amy and Sheldon are devastated after learning from a Russian paper that Super Asymmetry has already been discovered and disproven. They say that life imitates art, but the arrow goes both ways. Far more often, art imitates life. That's what happened in a recent episode of the hit television show "The Big Bang Theory." In the episode — "The Confirmation Polarization" — Sheldon and Amy receive an email from Fermilab. Two scientists had confirmed Amy and Sheldon's theory called Super Asymmetry. The researchers were studying a subatomic particle called kaons and the measurement and prediction (how it should behave in theory) disagreed. They called their measurement a failure until they realized that Amy and Sheldon's paper, published only a few months prior, explained the discrepancy. The two researchers were flown (in economy plus…more on that later) to Caltech to meet Amy and Sheldon. The Fermilab scientists are angling for a Nobel Prize and, because no more than three people can receive the prize, they are trying to cut Amy out of the picture. They tell Sheldon if he can get the President of Caltech to nominate the three of them for the Nobel, combined with the nomination from the head of Fermilab, they'd have a strong case for receiving the honor. Sheldon decides that if Amy isn't included on the nomination, that he doesn't want to be on it either and he tells that to the President, who explains how this will result in a fight with Fermilab; he adds that he has their back. The episode ends with the situation left unresolved. Let me start by saying that I like "The Big Bang Theory" a lot. And the writers try not to stray too far away from real science in their episodes. In fact, David Saltzberg of UCLA is both a research collaborator of mine and a scientific consultant for the show. He makes sure that the writers don't include any scientific topic that is too outlandish and disreputable. How about the experiment? Could two guys at a laboratory like Fermilab confirm a theory like Super Asymmetry using kaons? Well, it's certainly possible that direct measurements of kaons could disagree with predictions and that a new theory is needed to explain that discrepancy. So, we'll give them that one. But modern experimental groups have way more than two people on them. My own research group (which is diligently testing the idea of the real-world supersymmetry) involves about 3,000 scientists drawn from across the world. This experimental group, called the Compact Muon Collaboration, or CMS, uses data collected at the CERN laboratory in Europe. CERN is Fermilab's sister laboratory, and it hosts the Large Hadron Collider, which accelerates beams of protons to near the speed of light, colliding them inside a 5-story tall scientific apparatus, called the CMS detector. The CMS collaboration is comprised of scientists from about 200 research institutes. The Fermilab CMS group is made up of about 100 scientists and even more engineers, technicians and computer professionals. If CMS discovered supersymmetry, the credit wouldn't go to just two researchers from Fermilab. And what about the Nobel Prize thing? It's certainly true receiving the Nobel Prize is the secret goal of any physicist. But there was a lot wrong with the description in the TV episode. For instance, Amy and Sheldon's paper had come out only a few months prior and there was just one measurement confirming the finding. That's absolutely nothing like how it would really happen. To begin with, there are hundreds of papers written predicting new physical phenomena. It takes a fair bit of time to compare the prediction to data; and it takes even more time to rule out all of the other predictions. In addition, if Super Asymmetry were real, it would make predictions that would have to be confirmed with other measurements. All of that work would take a lot of time. But let's chalk this up to "television time," like in the CSI television shows when a DNA test is done in 10 minutes. So, I'll generously give them this one. A big chunk of the plot focuses on who would get the Nobel Prize, if it were awarded. And this is a mixed bag. It's true that the Nobel can go to at most three people. But the nomination process is different. Members of the Swedish Academy of Sciences can nominate, as can previous Nobel laureates and some distinguished professors who are asked for recommendations. So, it is possible that the Fermilab director is on that list. I don't know that he is, but he certainly has the international stature to be invited. However, it is unlikely that the President of Caltech is on the list. We'll call that a split. When Sheldon declined to be nominated without Amy, there is historical precedent. For the Nobel Prize in Physics in 1903, Marie and Pierre Curie had done extensive work in the newly discovered field of radioactivity. Given the era and the status of women at the time, the initial nomination was only for Pierre, in spite of Marie being the intellectual leader of the couple. Pierre wrote the committee and declined to be nominated without Marie being co-nominated. He prevailed and the two shared the Nobel Prize with Henri Becquerel, another legend of early radiation studies. So that aspect of the episode rang very true. The episode had a mix of fiction, truth and almost truth, but it got me wondering what sorts of research at Fermilab might actually get the Nobel Prize. Looking in the past, there is the 1995 discovery of the top quark, although I think that one is unlikely. But, looking forward, there are several experiments that might qualify one day. Currently at Fermilab, an experiment called g-2 (G minus 2) is studying how subatomic particles called muons wobble when put in a magnetic field. Muons are like chubby, unstable electrons, and earlier measured and predicted behavior disagree in a tantalizing way. The g-2 experiment will establish whether the discrepancy means a discovery. If it is a discovery, it could well lead to a Nobel prize. Bringing the story back to "The Big Bang Theory" episode, a proposed explanation of the currently observed discrepancy is supersymmetry. Then there are some future experiments. DUNE will study the behavior of neutrinos and antimatter neutrinos to look for differences. If they behave differently, it could be the explanation for why the universe is made of matter and not equal parts of matter and antimatter. That would be a Nobel. And then there's the mu2e (muon to electron decay) experiment, which looks for a specific type of muon decay. If observed, that's another Nobel. And, of course, Fermilab scientists are looking for dark matter and dark energy, mysterious substances that outnumber ordinary matter by a ratio of 20 to one and will determine the evolution and future of the universe. Those are fertile grounds for Nobel prizes as well. It could well be that the episode's prediction of a Nobel prize for Fermilab will come to pass in spirit, if not in real life. If you’re interested in learning more about the Fermilab future research program and these possible future Nobel prizes, I even made a video about it. I suppose that I should tell you about the one thing in the "The Confirmation Polarization" that rang totally false. The Fermilab scientists flew economy plus. Pfffftttt…total nonsense. For us, it's coach all the way. If a traveling scientist wants a few precious inches of legroom, they have to pony up the difference. They shouldn't even tease like that. That was just mean. Science on television is rarely exactly right and that's OK. Most television is supposed to be entertaining. But it's nice when they can incorporate some real science into it. It can get kids interested in science. This is supposed to be the last season of "The Big Bang Theory," and I'll be sad to see it go. Don Lincoln contributed this article to Live Science's Expert Voices: Op-Ed & Insights. Originally published on Live Science.